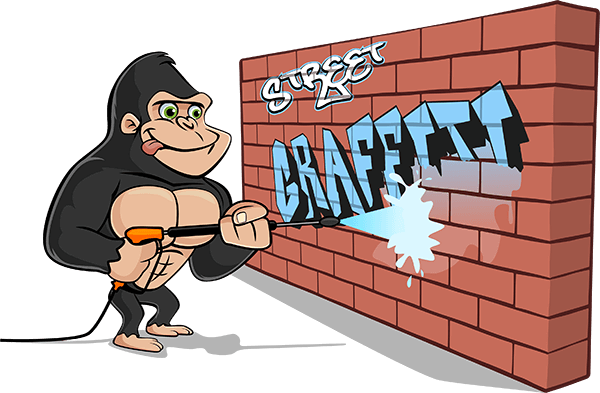 Ladner Graffiti Removal - Gorilla Property Services - Call Us Now! If you find yourself visiting a graffiti removal page, there is good news and bad news. The bad news? Your property has more than likely already been hit by graffiti. The good news? Our Gorillas can help! When it comes to getting your property back to its former glory, trust our Ladner graffiti removal service. When your home or business has been hit with any sort of graffiti, your first instinct will be to try to get rid of it. There is a standard list of things you should and shouldn’t do. Don’t: Try to clean away graffiti on your own. Using the wrong cleaning solutions to try to tackle aerosol paints can lead to an even bigger mess. harsh chemicals can damage surface layers of your property or cause the paint to bleed. Drips marks that come as a result of these chemicals stretch the stain out instead of taking it away. Do: Call in professional help! Gorilla Property Services has been in the industry for decades. We have seen all sorts of paint on all sorts of materials. There are certain ways to treat each and every exterior material – and we know them all! It is never easy to remove graffiti but our Gorillas have ways of easing that pain. Graffiti: Here Today, Gone Today! Having graffiti splashed across your home is no fun, but having it across your storefront is even worse! Often times, graffiti is tags are simple. Names or small designs are an annoyance but racism and hate speech are downright cruel! That is why our Gorillas are always on call for your Ladner graffiti removal. We strive for same-day removal for our clients – and if we can’t get to you, you will be our first appointment the next day. In addition to timely service, our Gorillas think of your Ladner graffiti removal in the long-term. Gorilla technicians completely remove any paint and residual staining, as well as applying an exterior coating. This coating makes it easier to remove paint if you should find yourself vandalized again.